Uncut McCall's easy stitch & save sewing pattern 8030. Misses sizes 8 10 12 14. Lined vest and pull on shorts. Princess seamed lined vest features back self fabric ties, pull on shorts with side seam pockets have two rows of elastic through fold back waist casing. 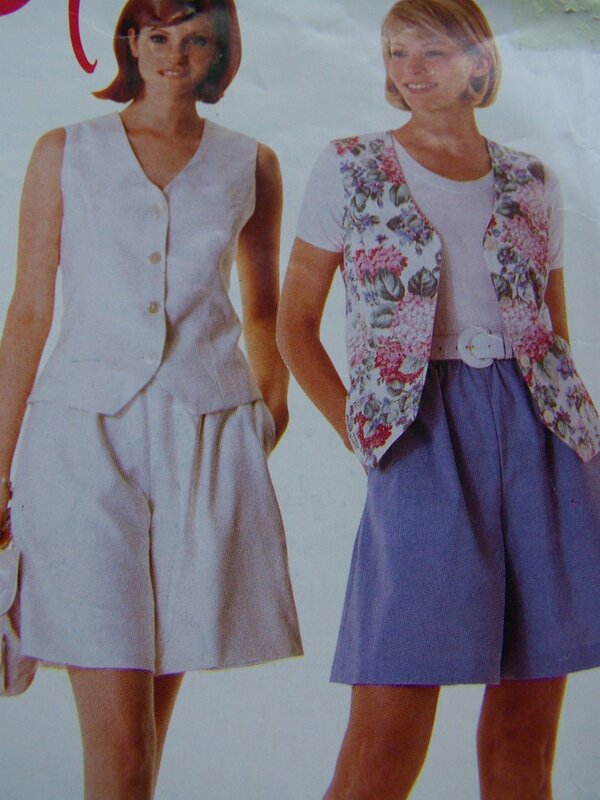 More vintage and new home craft sewing patterns listed and more coming to both of my stores. Measurements: Bust 31.5 - 36". Waist 24 - 28". Hip 33.5 - 38". Suggested fabrics: Cotton and cotton blends, challis, linen, seersucker, chambray. Vest lining - lining fabrics. **UnCut, complete with instructions. I have more new and uncut craft and home decor patterns listed in my store and more coming, check out my other items! Some envelopes are torn, have writing or yellowing from age. Cut patterns may have notes, tape, pinholes, tracing wheel lines or a wrinkled piece. I only tape an envelope when it is necessary to keep the pattern in the envelope. S & H to the USA is $2.25 and only $1.00 or less for each additional sewing pattern. S & H to Canada $3.50. **International: Paypal only. Please ask for your countries shipping cost. I HAVE OVER 12,000 VINTAGE SEWING PATTERNS, VINTAGE CROCHET KNITTING AND PLASTIC CANVAS PATTERNS IN STOCK! !